Exalted or enthusiastic expression of feeling in speech or writing. A literary work written in an impassioned or exalted style. A state of elated bliss; ecstasy. An ancient Greek epic poem or a portion of one suitable for uninterrupted recitation. A musical composition, usually instrumental, of irregular form, that often incorporates improvisation. Rhapsody to Central America - the adventure! After falling in love with sailing in 2005 and getting my first sailboat, Mandala, a Catalina 36, and sailing her all over California in 2006, I decided to take the next big step and try full time cruising. In March 2007, I purchased Rhapsody - the boat. To ensure that I would get a good exposure to the lifestyle, I alloted 18 months to Rhapsody to Central America - The Plan. I wanted to make sure that I experienced enough of cruising to be able to truly decide if I liked it or not. 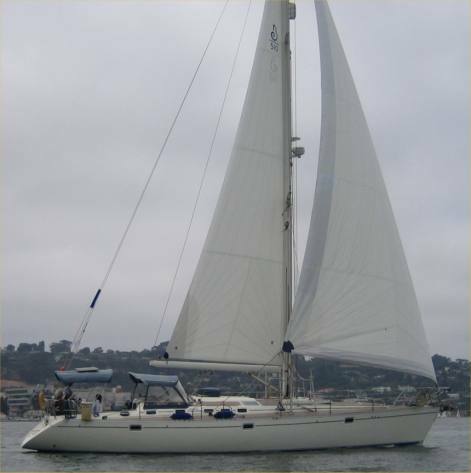 So, somewhat agressively, I decided to leave San Diego in November 2007, and sail down the Mexican Riviera for 6 months, with leisurely stops at all the nice places along the way, then spend six months cruising the west coast of Central America, mostly around Costa Rica and Panama. After transiting the Panama Canal, I would then spend another six months working my way up the east coast of Central America back to the USA, ending up in Houston or New Orleans, or some other Gulf Coast City, 18 months after I left home, in June or so of 2009. As I write this now, I have essentially completed the initial year-and-a-half experiment. It seems like so long ago that I sold my car and most of my personal possessions, rented out my house, and moved onto Rhapsody. There were months of working on her, getting her ready for the voyage, and the first tentative steps as I learned how to sail her around San Diego and Southern California. I left as planned on the 2007 Baja Ha Ha cruisers rally and worked my way down Mexico and Central America, visiting dozens of places and meeting hundreds of people. On a few treasured occasions, friends and family flew to Mexico and joined up for legs of the voyage. It has been a great adventure and I have posted hundreds of photos and dozens of webpages about the adventure in the ships log - Rhapsody to Central America - The Adventure. I stayed pretty true to the plan as Rhapsody went through El Salvador, Nicaragua, Costa Rica and Western Panama. I transited the Panama Canal in October of 2008, which was an adventure of its own. I then visited the famous San Blas Islands, purported to be one of the two best cruising grounds in the world, a conjecture with which I would have to agree. And now, as I'm writing this, I'm in Bocas Del Toro, Panama, where I've decided to stop and re-evaluate. You see, my initial plan, drawn up on the internet while sitting snugly in a bedroom of my suburban house, before I had any real experience of the region or conditions, and before Hurricane Ike hit Houston pretty hard in 2008, failed to take into account that the Gulf Coast of the U.S.A. is not really a good place to keep a boat during hurricane season. Now that I have a few miles under my belt and a better understanding of what it means to live on a boat, I've decided, for the time being, to base Rhapsody out of the Bocas Del Toro region, which is in Panama, safely below the hurricane belt, and take some time to figure out what to do next. For the next year I generally plan to work my way from Bocas Del Toro, through the San Blas Islands, to Cartegena, Colombia, and back to Bocas again. It's a wonderful cruising ground and not one I'm quick to want to leave. In the future, I will probably visit Belize and and the Yucatan. Eventually, I may like to try the clockwise circle thru Florida to the Eastern Caribbean, down the Windward Islands to Trinidad and Tobago. Perhaps someday I will even re-transit the Panama Canal and cross the Pacific Ocean to Polynesia and points beyond. In the meantime, however, while I figure out where to go next, I hope you enjoy this website and the story of Rhapsody to Central America.